The imaging system fits inside a standard syringe needle, enabling possible delivery to organs or even the brain. Image courtesy of the University of Stuttgart, 4th Physics Institute. German scientists have produced a camera, using additive manufacturing with a femtosecond laser printer, capable of building free-form optics. 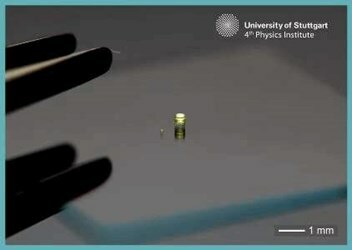 Researchers claim that technology opens possibilities for micro- or nano-optical devices, such as endoscopes and mini-robots with autonomous vision, and paves the way for a “paradigm shift” in medical imaging that could be injected into the body through a syringe. To overcome these limitations, the team used two photon red laser beams with pulse durations shorter than 100 femtoseconds (one femtosecond equals one quadrillionth of a second) into liquid photoresist containing a glass substrate to harden the polymer forming the lens. When finished, the unexposed photoresist is washed away with a solvent. The method, said scientists, is capable of building optical lens systems with two or more lenses with sub-micrometer accuracy, according to a press release. The finished compound lens is 100 micrometers wide and 120 micrometers in its casing, and it can produce high-quality images of objects three millimeters away and transmit through an attached optical fiber, reported ABC Online. “The unprecedented flexibility of our method paves the way toward printed optical miniature instruments such endoscopes, fibre-imaging systems for cell biology, new illumination systems…and robots with autonomous vision,” said researchers in the study, adding that optical systems designed with the technology would allow for the minimally-invasive exploration of the human body, even the brain. NASA scientists recently introduced the world’s smallest 3D camera developed for endoscopic brain surgery, which was designed to assist neurosurgeons with complicated skull-base tumor extractions. Compared to existing neuroendoscopic tools that offer panoramic views of 30-70 degrees, the multi-angle rear-viewing endoscopic tool (MARVEL) offers a 120-degree view. Also, a team from Harvard University is working on injectable mesh laced with electrodes that would allow scientists to monitor and potentially treat neurodegenerative diseases, such as Parkinson’s disease or damage caused by stroke.